An unincorporated community, Castro Valley was once an agricultural area that has grown into a suburban town of 60,000 people with multiple freeway exits, a BART station, and little vacant land. The General Plan Update grapples with many issues, particularly identifying and regulating desirable infill development, balancing vehicular convenience with pedestrian safety, and redeveloping the main commercial corridor. The General Plan presents a vision and implementation strategy to create a pedestrian-oriented downtown with new retail and infill housing, transforming this underutilized area. Other new policies address design guidelines for residential infill, safe routes to schools, and preservation of existing neighborhoods. These redevelopment and infill strategies are codified in an updated Zoning Ordinance, prepared by Dyett & Bhatia. 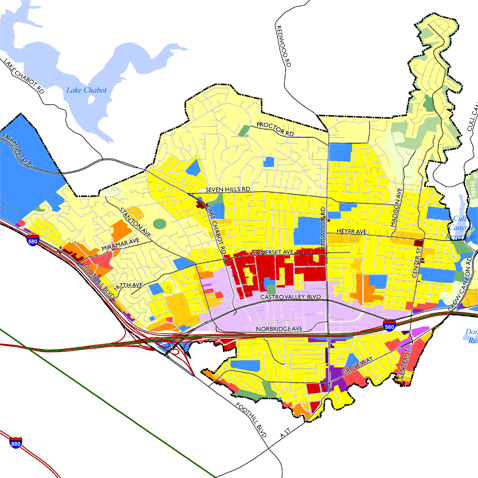 The updated Ordinance reduces complexities in the menu of base districts allowed by Alameda County and creates new districts and overlays that adhere closely to existing and desired development. The Zoning Update aims to make targeted types of new development easier to entitle, while significantly reducing approvals through variances. The end result will save time and money and encourage outcomes desired by the Castro Valley community.